Isabella Fauria from Roseville continued to impress at the Golden West Invitational with 2:19.51 (800) and 11:09.94 (3200) times. You can view complete results from the meet here. Definitely an athlete/runner to keep our eyes on for years to come. 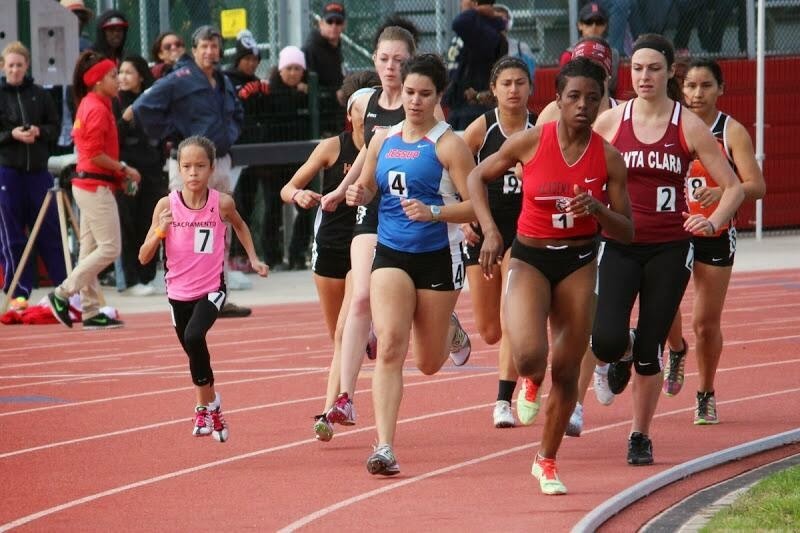 The picture below is from the Kim Duyst Invitational, Stanislaus, with Izzy competing against the collegians earlier this season (courtesy of BB Running coach, Joe Hartman). Pretty cool but I have to admit that the picture kind of freaks me out. It's even more impressive when you consider the times run by Mikaela Smith (800), Julia Maxwell (1600) and Lauren Jacobs (3200) All accomplished runners running 'well below' their PR's. It must have been extremely windy and/or hot. I was at the meet and the weather was warmer earlier but really cooled off nicely for the 3200 races. Mikaela Smith led the 800 the entire way and was never pressed. As for Maxwell and Jacobs, I think it's a tough rally for some kids to to run fast in a post-season meet after pointing to the state meet the entire season. As Isabella's mom I can tell you that she does not get over trained! Izzy just has a natural running talent! She trains twice a week for couple hours. She also plays competitive soccer, swims, golfs, and plays basketball for her school. She runs with a big heart and is still a kid at heart! I’m happy to say that we do not believe in over training her why because she just loves to run!! As a former youth coach, over youth that have gone on to open US World and Olympic teams in track and XC, I will pray that Isabella does not get over exposed to racing with the "big kids" and looses her passion for the sport. Talent is a large part of track and XC. But, without passion talent usually only gets an individual so far. My prayers are with Isabella and her parents to overcome the many trials of raising a gifted child. I watched her run at the JOs and GW. What a joy to watch a kid running with that much skill and fun. All you needed to do is hear her interview on the field at JO to know that she is well balanced in her approach. Keep up the good work mom! Isabella does not run 40 miles a week or gets any special type of training! Isabella is a well rounded athlete and very competitive!